I did a quick fact check. 4 minutes to find the data, and another 5 for some calculations (see Statistics Canada at www.cic.gc.ca/english/resources/statistics/facts2013/permanent/10.asp). Canada’s population is about 35,750,000. Current policy: admit between 260,000 and 285,000 immigrants a year. In the last year reported (2103) 258,953 came. Of these, about 65,000, or about 1 in 4 came from majority Muslim countries. Even if none of them were actually fleeing radicalism, but were all bad guys, the highest potential number of Islamic radicals is overshadowed by 3 to 1. They can never become a majority this way, in fact, this becomes less likely every year. Even if we insanely changed immigration law so we only accept fundamentalist muslims and no one else, how long before they become a majority? Grade 2 math gives us 35,750,000 divided by 285,000 as 125 years. So this fear has no basis in reality. None. A 4 minute fact check and Grade 2 math tells us that. So this fear is born of passion. And begs the question – how can well-educated, normally rational people become so afraid they can’t see a blatantly obvious hoax? Where did they get this idea? The answer is also obvious. From politicians. Fearful people become angry and irrational. If you’re a politician with a poor track record that is sure to lose if voters behave rationally, your only chance of keeping power is to make voters irrational. If voters are irrational because of what you have said to them, they are more likely to be fooled by whatever else you say. The politicians spreading this lie are fully aware it is a lie. So, to my friends who have been hoaxed, I ask you to do three things. First, look in the mirror, take a deep breath, and re-center yourself without this phobia. It’s not real; you need have no fear. Second, ask yourself who has such contempt for you that they deliberately played you for a fool by lying to you to make you angry, confused and irrational. What does this person really think of you and your interests? Thirdly – don’t vote for them. Canada deserves better than politics like this, and politicians who play these kind of hurtful games deserve the harshest possible response on voting day. P.S. Please don’t think I in any way support fundamentalist Islam, or any other fundamentalist religion. They are all the cause of great evil. 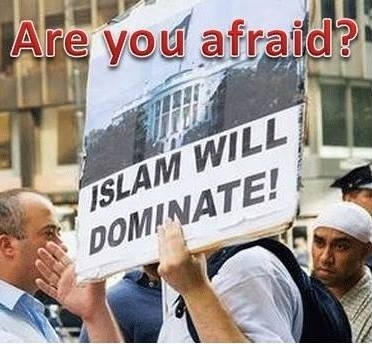 But we have no need to fear Islam in Canada today, or for any foreseeable future.